Before I get started with my project, I just wanted to say a quick Thank You to everyone who has left such kind comments about our VBS program. Tonight will be the last night of our program and it has been going wonderfully! The set (you can see it here) has been a huge success, the classes have been great and the kids have been having a wonderful time. It's been such a blessing for me to be able to share this experience with my grandchildren. Emma has been taking part for several years now, and Blake is enjoying his first year of VBS with Nonna and Papa. As I write this it is just after midnight and the two of them are zonked out on an air mattress in my bedroom, sleeping the sleep of tired little children! And, if I had any sense at all, I would be asleep with them! But, it takes me awhile to wind down so I thought I would share a card with you as I enjoy a few minutes of quiet! * I used the "Shadow/Card" feature found on page 27, cutting at 6.5 inches on white cardstock. 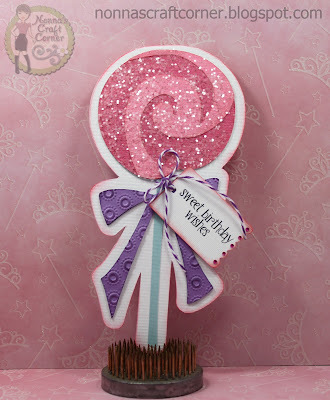 The edges were inked up with Distress Ink in "Worn Lipstick"
* I cut out the lollipop image and covered the candy portion with Martha Stewart Coarse Glitter. * The purple bow was embossed with the Sizzix embossing folder "Dotted Flower Rings". 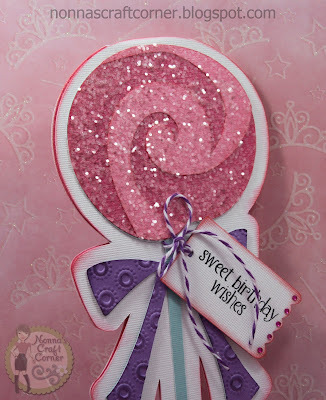 * I used the stamp set "Say It Sweet" from Pink By Design to add a birthday sentiment to my tag. Then added a few gems and some twine from "The Twinery". I love how quickly this fun little shaped card came together and look forward to using this cartridge again! Thanks so much for stopping by and I hope you enjoyed this sweet card! I hope to be back soon with another project and some VBS photos to share with you soon! What a wonderful post! Love the VBS story! Yur card is wonderful! Love all the detail! Super cute....love all that glitter!! My son is at VBS this week and is having a great time--it's that time of the summer isn't it! It is adorable! I love the glitter and the embossing. My daughter would love this card, I will have to show it to her tomorrow ;-) Good luck with VBS. We have ours in July. Absolutely Adorable! I love the glitter!!! Sooo cute. Love the glittery lollipop. This is so FUN and sparkly! I love it and the embossing looks great! So glad the VBS is going well:) Have a great wknd! Very pretty shaped card,love the glittery lolly and your embossed bow.I haven't seen that folder before...off to track it down..lol!